Spring has sprung and that means the A to Z in April Challenge is almost upon us! Now somehow, I’m a little less organised this year compared to the previous three years I’ve taken part so I’m a bit later actually saying I’m going to take part and I’ve yet to write any of my posts. But before I get into all that, I should let you know what the Challenge is if you’re new to it or to my blog. The challenge is to post a blog every day of April bar Sundays. Since there are 26 days in April (not including Sundays), that matches the 26 letters of the alphabet. So, on April 1st, blog about something that begins with the letter “A”, April 2nd is “B,” April 3rd is “C,” and so on and so forth. This year my “theme” for the challenge is My Favourite Things. This includes pretty much anything – my favourite foods, favourite songs, favourite actors, characters, films, things to do – anything! I currently have something for 24 days of the challenge (I’m missing something for G and O right now) but I haven’t started writing any of them. I will probably start writing and scheduling posts by the weekend, I’ll definitely have to make sure I’ve got posts from 7th-11th April scheduled as I’m going away for a friend’s wedding over that weekend. 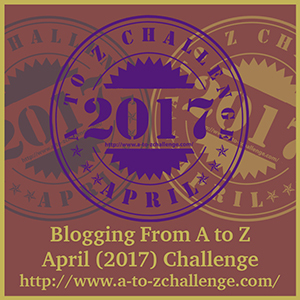 The A-Z in April Challenge has kind of been a bit of a blogging tradition for me now and I’m looking forward to taking part in it again this year. My usual book and film reviews might take a bit of a back seat during April as my focus will be on the challenge, though I suppose it depends on how I do with scheduling everything. To find out more about the challenge (and you’ve still got time to sign up!) check out their blog here and if you want to see what I’ve written previously for the challenge you can have a look at my 2014 Masterpost, 2015 Masterpost and 2016 Masterpost. Interesting theme 🙂 Good luck with the challenge!